A Neighborhood of Infinity: What is a photon? Popular science writing about quantum mechanics leaves many people full of questions about the status of photons. I want to answer some of these without using any tricky mathematics. One of the challenges is that photons are very different to ordinary everyday objects like billiard balls. This is partly because photons are described by quantum mechanics whereas billiard balls are better modelled with classical Newtonian mechanics. Quantum mechanics defies many of our intuitions. But it's also because the word photon plays by different linguistic rules to billiard ball. I hope to explain why. It's actually a sine wave but that detail doesn't matter for us right now. 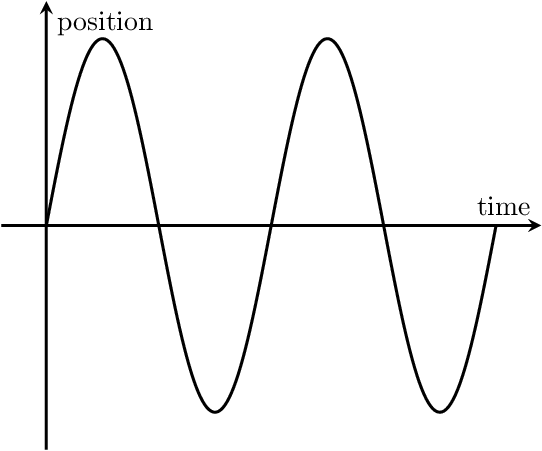 An oscillator where the restoring force is proportional to the displacement from the equilibrium point is called a simple harmonic oscillator and its oscillation is always described by a sine wave. Note that I'm ignoring friction here. This is a reasonable approximation for many physical systems. At a more fundamental level, an example might be an atom in a crystal being held in place by electrostatic forces from its neighbouring atoms. If you have one of these systems, then in principle you can set it in motion with as little energy as you like. Pull a mass on a spring down a little bit and it will bounce back up, oscillating a certain amount. Pull the mass down half the amount and it'll bounce with oscillations half the size. In principle we could keep repeating this experiment, each time starting with the mass displaced half the amount we tried previously. In other words, a simple harmonic oscillator can have any energy we like. 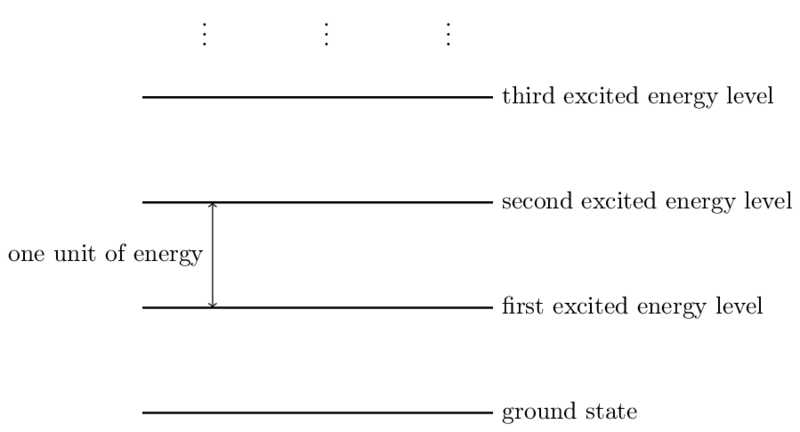 The spectrum of possible energies of one of these oscillators is continuous. (Note that the word spectrum here is merely physicist-speak for a set of possible values.) If we can set one in motion with 1 unit of energy then we can also set it oscillating with 0.5 units, or 0.01 units, or 0.000123 units of energy. 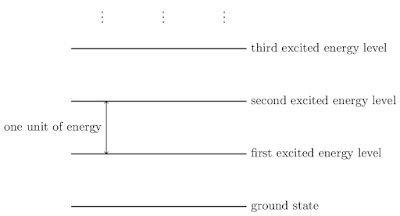 We usually call the lowest energy level the ground state or vacuum state and call the higher levels excited states. The spacing of the energy levels depends on the stiffness of the system, which is just a measure of how much the restoring force increases with displacement from equilibrium. Stiffer systems will have a higher frequency of oscillation and a bigger spacing between the energy levels. In practice the difference in energy between one level and the next is tiny. This means that if you're literally fiddling about with a mass on a spring you won't ever feel the discreteness. The amount your hand trembles is many orders of magnitude greater than the effect of this discreteness. Nonetheless, it is extremely important when modeling microscopic systems. This system is in the ground state. After allowing these two similar oscillators to interact, the energy level of this oscillator went down and the energy level of that one went up by the same amount. Some quanta were transferred from this system to that system. Those sentences make it seem like I'm talking about a new kind of object - the quantum. But I'm not. They're just a manner of speaking about energy levels. I hope I've given you enough examples to get the idea. Just in case you think it's weird to talk about energy levels in terms of quanta, I'd like to remind you that you already do this all the time with money. Dollar bills are actual objects that exist in the world. But money in your bank account isn't. Somewhere in some database is a representation of how much money you have. You might say "I have one hundred dollars in my savings account" But those dollars certainly don't exist as distinct entities. It doesn't really make sense to talk about the thirty-seventh dollar in your bank account. You can transfer dollars from one account to another, and yet what's really happening is that two totals are being adjusted. We treat these accounts a lot like they're containers holding individual objects called dollars. Certainly our language is set up like that. But we know that it's really just the totals that have any kind of representation. The same goes for quanta. It's just a manner of speaking about systems that can have different amounts of energy and where the spectrum of energy levels forms a ladder with equally spaced rungs. Because of your experience with money I probably don't need to give you any more examples. One more bit of terminology: when the spectrum of energies is discrete it's said to be quantised. 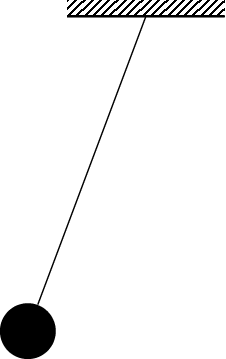 We restrict ourselves to just considering back and forth motion constrained along a horizontal line. This is a coupled system. If the left mass moves to the right, not only does it experience a restoring force pushing it left, but the mass on the right will experience more of a force pushing it to the left. We can't treat the masses as independent and so we don't get the simple solution of each mass always oscillating with a sine wave. For this particular problem though there's a trick to turn it into a pair of harmonic oscillators. The idea is to consider the pair of masses as a single entity. We can think of the motion centre of mass of the pair, the midpoint between them, as being one variable that describes this entity. Let's call its motion the external motion. We can also think of the distance between the two masses in the pair as being the system's internal motion. (I'm just using internal and external as convenient names. Don't read too much into them.) It turns out that when you analyse this using classical dynamics the internal motion and the external motion act like independent quantities. What's more, each one behaves exactly like it's simple harmonic. So we get one sine wave describing the overall motion of the pair, and another one that describes how the elements of the pair oscillate with respect to each other. The frequencies of the internal and external motions are typically different. So you can end up with some quite complicated motions with two different frequencies beating against each other. When we're able to find ways to split up the motion into independent quantities, each of which is simple harmonic, each kind of motion is said to be a normal mode. When you have independent normal modes, you can treat them independently in quantum mechanics too. So what we get is that the spectrum of possible energy levels for this system is, in some sense, two-dimensional. We can put quanta into the internal oscillation and we can also put quanta into the external oscillation. Because these modes have different frequencies the quanta for each mode correspond to different amounts of energy. A real crystal would be arranged in a 3D lattice but I've drawn 2D here for convenience. Think of the springs as both pushing apart atoms that get close, and pulling together atoms that move apart. This is a highly coupled system. Ultimately every atom in our lattice is connected to every other one, either directly, or indirectly. Nonetheless, it is still possible to find normal modes. The normal modes all have the same basic form: they are all sinusoidal waves of displacement traveling in some direction with some speed and oscillation frequency. Each of these modes consists of waves that extend through the entire crystal, with fixed spacing between parallel planar wavefronts. This type of waves is known as a plane wave. If the system is perfectly harmonic, so the restoring force is precisely proportional to the displacement, then each direction and frequency of wave oscillates its way through the crystal completely independently of any other. Just as how in the example with two masses any possible oscillation is a combination of internal and external motion, for a crystal lattice any motion is a combination of these plane waves. (Decomposing any oscillation as a combination of plane waves is known as computing its Fourier transform. Now we're ready to consider this situation quantum mechanically. Because each plane wave is a normal mode, we can treat each one as an independent simple harmonic oscillator. This means that the energy in each plane wave is quantised. So when we consider a crystal lattice quantum mechanically we find that its states consist of plane waves propagating through it, but where the amount of energy in each wave is given by a discrete spectrum. So again we can talk about how many quanta there are in each mode. Linguistically it gets a bit more interesting now. Each plane wave is associated with a particular direction and speed so it makes sense to talk of these quanta as having a direction and speed. But note that statements involving quanta are still really just sentences about energy levels. So, for example, the statement "the mode of this system with this velocity and frequency is in its first excited state" is, by definition, exactly the same as "this system has precisely one quantum with this velocity and frequency". In particular, when we write sentences like these we aren't implying that there is some new kind of object, the quantum, that has suddenly attached itself to our crystal. The quanta are properties of the lattice. 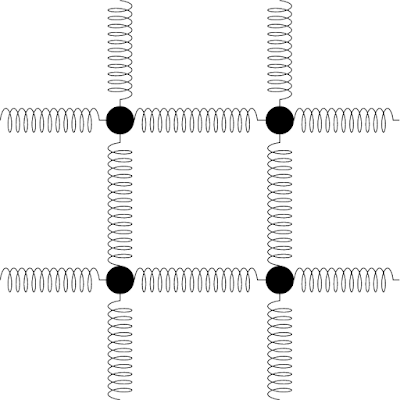 By the way, in the particular case of vibrating atoms in a lattice, the quanta are known by a special name: phonons. And now we're ready to move onto photons. In classical physics, electromagnetism is described by Maxwell's equations. Maxwell's equations say that a varying magnetic field generates an electric field and a varying electric field generates a magnetic field. The result is that it is possible for an oscillating electric field to create an oscillating electric field so that an electric field can propagate through space on its own without the help of electric charges or electric currents or any other kind of `generator'. As these electric fields also produce magnetic fields that propagate with them, the whole thing is called an electromagnetic wave. 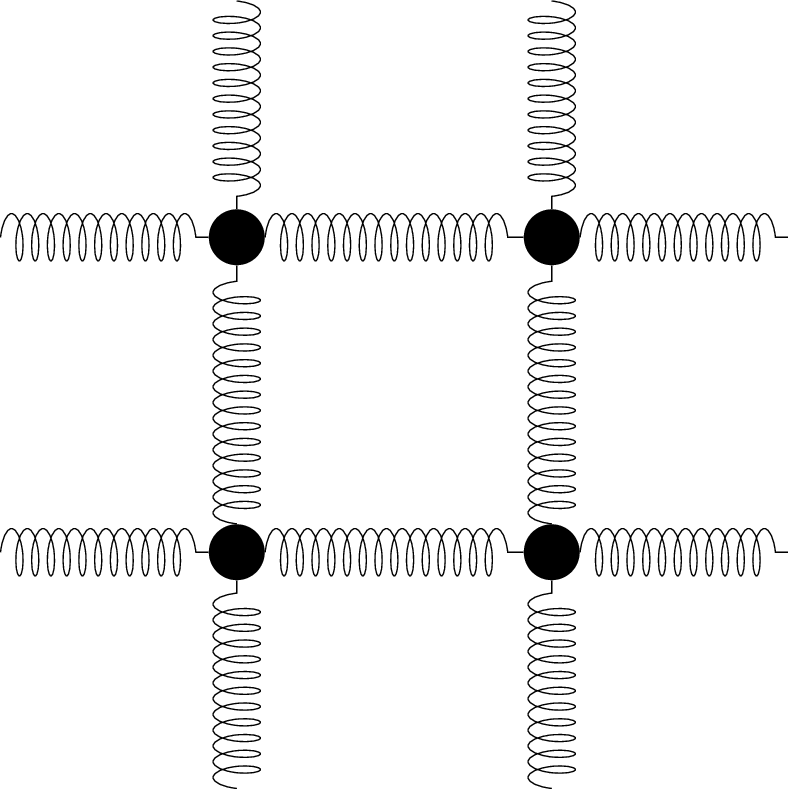 Just like displacements in a crystal lattice, an electromagnetic wave also has normal modes. The normal modes are plane waves traveling at the speed of light in a particular directions with a given frequency. You have personal experience of this. Visible light is electromagnetic radiation with a frequency of around 500 THz. Wifi uses signals at around 5 GHz. The radio might use signals at around 100 MHz. When you surf the web wirelessly while listening to the radio, the wifi signals don't interfere with your vision or the radio signal. (Actually, wifi might interfere with the radio signals, but not because of the 5 GHz signals. It might happen if badly manufactured hardware emits stray signals around the 100 MHz band.) That's because these waves pass through each other without being coupled to each other in any way. And at this point you might already be guessing what a photon is. For each choice of frequency and direction (and also polarisation, but that's just a detail) the amount of energy that can be in the corresponding mode is quantised. For the electromagnetic field the quanta are called photons. Electromagnetic waves can be thought of as being made up of different oscillation modes. Because of quantum mechanics, each mode contains an amount of energy that is quantised to be a whole number multiple of some base amount. Although the thing that really matters is the total amount of energy in the modes, it can still be useful to talk about this total as if it's a collection of entities called photons. One thing to notice is that the normal modes for an electromagnetic wave are plane waves that are extended in space. In principle all the way across the universe but for practical problems physicists often consider electromagnetic waves in a large but finite box. This means that adding a quantum to a system has an effect that extends across the entire system. That makes it problematic to talk about the location of a photon. Physicists sometimes use the word photon in slightly different but related ways. I've described what I think of as the core definition as presented in many courses on quantum field theory. Thanks to @dmoore2718 for encouraging me to edit this document down to a better size. Typo: if you move the mass on the left to the right, the mass on the right will feel a force pushing it to the *right*, not the left. Many thanks for this! It really helped me to come closer to solving the "E = h·f" (personal) mystery. Don't you want to make an article about that? I will be grateful. Having an Electronic Engineering background (classic EM for RF and a little of QM for semiconductors) I have never been able to understand why the photons of a macroscopic EM wave causing electrons in a conductor move with certain frequency f, have each one h·f joules. I always hope to find a nice equivalence similar in spirit to the one between macroscopic pressure and microscopic momentum of atoms in a gas. Thanks to this article I started reading more about QFT and I'm starting to see "the light" at the end of the tunnel. @Francisco Albani This *is* the story behind E=hf. The only thing missing is that I didn't say what the spacing is between energy levels. Quantum mechanics predicts that if you have a harmonic oscillator of frequency f, then the spacing between energy levels is hf.. So that leaves having to explain why harmonic oscillators have energy levels with spacing hf. I deliberately left that out because I don't know an easy argument as it's a fundamentally quantum mechanical argument. I could probably say something about why you might expect a discrete set of energy levels but it would still require talking about wave functions or some such thing. I'd always been confused when Harmonic Oscillators made an appearance in quantum mechanics questions in, for eg., r/askscience, so thanks for this simple from-the-scratch explanation. How do wave-particle duality and things like the double slit experiment with photons fit into this explanation though, what the best way to think of them knowing this? When a physicist sets out to solve a problem using quantum field theory, at no point do they say "we'll use wave-particle" duality. There is no such principle in physics. It's a made up thing stated after the fact by philosophers and pop science writers (and by science writers when forced to write introductions to textbooks). Still, I'll try to point out where the "duality" it is in what I described. The tricky thing here is that there are two waves. I don't even know which should be the wave in the duality. There's the EM wave. And then there's the quantization of how much energy there is in each harmonic wave which I've just described. So you have a wave-particle duality of a sort right there. But there's another wave buried in here. The idea is that when you have a harmonic oscillator that is a particle swinging back and forth in space there is a wave function associated with it. That wave function gives a probability to find a particle at any given position - the places where the wave function takes a larger value are places where you're more likely to find the particle if you measure its position. But for the EM wave the corresponding wave function is an abstract thing that says how likely the electric field or the magnetic field is to take a value at any particular point. So it's a wave on the very large (in fact, infinite-dimensional) space of all possible EM waves - not a wave in spacetime. Think of it as like a probability density function on the space of all EM waves. In this case, I think that's the correct wave when talking about wave-particle duality. But most popular accounts talk about the EM wave, not this abstract wave. I personally think that once you know the details, you can dispense with talking about wave-particle duality. I'm a lawyer with no concept of "higher" math, but I'm nonetheless keenly interested in physics, light, astronomy, etc. This article about photons is the best, most well-explained I've ever read in this area. Great job, and thank you! Great article, thanks! What happens to a normal mode represented by a sine wave when its energy is quantized? Does its amplitude become quantized too? "For the electromagnetic field the quanta are called photons"
thanks for the great analogies, can you extend these analogies to single photons [ or i see your comment to Sundar's question now but I'm still having trouble getting rid of the billiard-ballness view of that wavefunction when it comes to single photons], say single photons being emitted from these oscillating systems and how it takes time for the single photon to travel from the source of emission to a detector and then after that single photon is detected no other photon is detected? How do you reconcile conceptually the single quanta of energy(spectrum or frequency domain) of a photon to a single photon in space or time domain that has a high probability(thru the wavefunction) in a local region of space? Classically a single short pulse in time with a well defined location in space (not continuous wave) is broad in spectrum(energy or wavelength) through its fourier transform, is it right to say that this single short pulse is not *a* photon, but *many* photons? What about a continuous wave at an extremely precise single quanta/energy/frequency- is it right to say this is not *a* photon but *still* *many* photons in this continuous wave, since incident on a detector there are very many photons but still just one electromagnetic field at one energy/wavelength(one quantum)? Then what about when you attenuate that single energy continuous wave down to a very low power so that in one minute there is only 1 photon at one quantum(1 energy), isn't there some billiard-ballness in that those can be counted? A single photon's probabilistic location in space/time versus it's probabilistic quanta in energy/wavelength is related through the uncertainty principle relating k/wave-vector space to momentum space- how do we reconcile all this conceptually without any billiard-ballness? Leaning toward logic and generally limited to 3 dimensions, human thinking does not lend itself well to the quantum world. Nearly all aspects of physics and thermodynamics lose coherence -- and contradictions turn everything upside down. For the sake of discussion, if there is a God and he designed the systems that make up everything, everywhere, he was not only a master mathematician -- but the greatest magician imaginable. Hi Dan. Thanks. Do you mind if I summarise what you wrote for my own understanding? There is an electromagnetic field. It's oscillating at every point. 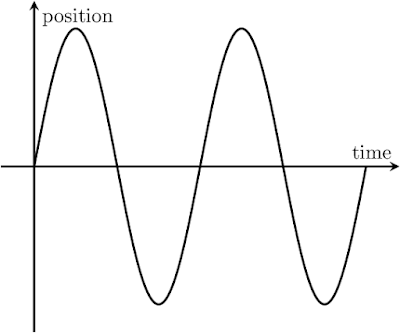 The oscillation at any point can be broken down into waves with independent frequencies and polarisations. The amplitudes are discrete. (You said the amplitude is a function of direction and frequency, but you should have also mentioned position, right?). **So**, when we say that there are 3 photons of some frequency f in some position p, we mean that the amplitude of the oscillation of the electromagnetic field at some frequency f at position p is 3 quanta. Question: What's oscillating? The direction and strength of the electromagnetic field at a point? > What's oscillating? The direction and strength of the electromagnetic field at a point? Exactly. The electric and magnetic field vectors. > but you should have also mentioned position, right? You can measure the electric and magnetic fields at a point, but you can view these fields as being built up from plane waves - ie. sinusoidal waves that extend across space. So they aren't in any particular position. They do have a direction though. Just like with ocean waves, electromagnetic waves have amplitude, frequency and direction. "when we say that there are 3 photons of some frequency f in some position p, we mean that the amplitude of the oscillation of the electromagnetic field at some frequency f at position p is 3 quanta"
"when we say that there are 3 photons of some frequency f in some direction k, we mean that the amplitude of the oscillation of the electromagnetic field at some frequency f and direction k is 3 quanta"
The Heisenberg uncertainty principle tells us that if we know the exact momentum of a particle, we don't know its position. It turns out that knowing the frequency and direction of a photon also tells us its momentum and therefore we can't assign a position. But even though we can't give the position of a photon in this sense, we can still talk about the value of the field at some point.